One step further to simple living! One of the things I recalled from Lyz’s blog when I first read it was that, during her six months of liberated shopping, she actually managed to get rid of some of her clothes that she found she was not wearing. Since I read that, I just couldn’t put it out of my head. Surely, the reason I shopped before was not because I needed three identical tank tops in three different neon colors, none of which I have worn more than once since purchasing. Maybe I should reevaluate the things I already have in the hopes of learning what I really need. As I may have mentioned before, I recently lost a lot of weight since last summer, which has made it somewhat difficult for me not to buy new beachy clothes this season; nothing I had this time last year fits me at all. 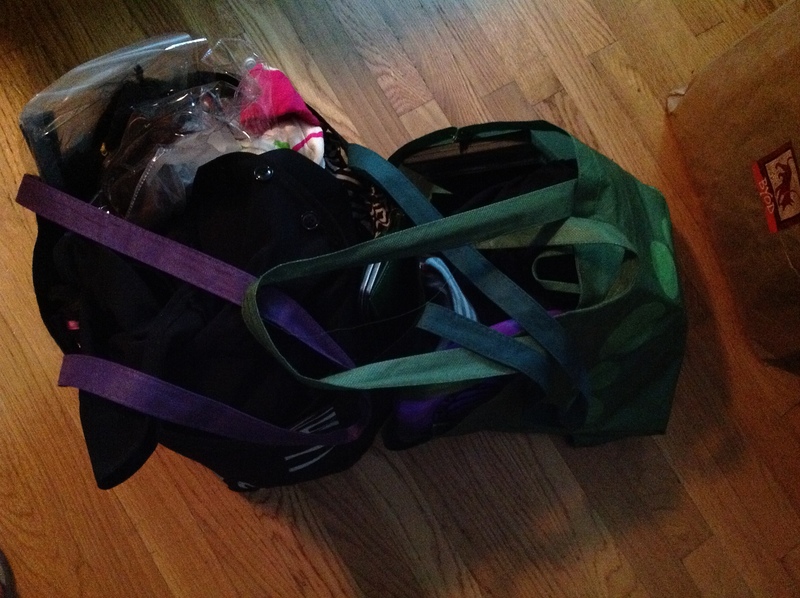 But this means that I was able to get rid of a bunch of stuff that was too big on me. As for wanting to buy new clothes? I haven’t, and it turns out that I have plenty of tanks I use as layers during the winter, and one, yes ONE pair of cut off shorts that I try alternating with jeans and long skirts. I’m quickly finding that wearing pants in the summer really isn’t all that bad (being from Florida and all…). You can see below the meager (but winning) pile of junk that I sifted from my closet and dresser. Mind you, this is all stuff I have previously scoured and decided worthy to keep in my wardrobe. That, my friends, makes me even happier to announce that I was able to get rid of it and walk away with $30 in cash from Buffalo Exchange! I like to think I’m helping my lady friends in need by giving away clothes that are in good condition and are stylish but just don’t fit me. I’ll admit, there were a couple (literally 2) blouses that I just couldn’t part with for sentimental reasons. Though they do still fit me, so I am going to try to fit them into my wardrobe in the next month. Otherwise they go in the next “Buffalo Exchange” pile next time around. I want to make this a regular occurrence (maybe every 3 months?). But, I can happily say that I can hang everything hangable in my closet AND still have space for empty hangers! Trust me, folks, this has never before been possible. I have become good friends with the iron in the last year. One thing I am learning to do throughout all of this is that, aside from this not being easy, I am learning to value the little wins. I know I only went through my clothes and that I have two full-size book shelves in a 10×10 room (when did this happen?! ), and a desk that I cannot put anything on for all the clutter… but if I focus on the things that still need to get done over what I have actually accomplished, I will get overwhelmed. Keep on keepin’ on, essentially. Wish me luck!